As Fall quickly approaches, the bitter winds bring with them a hope… of a new Private Stock Calendar release that is. 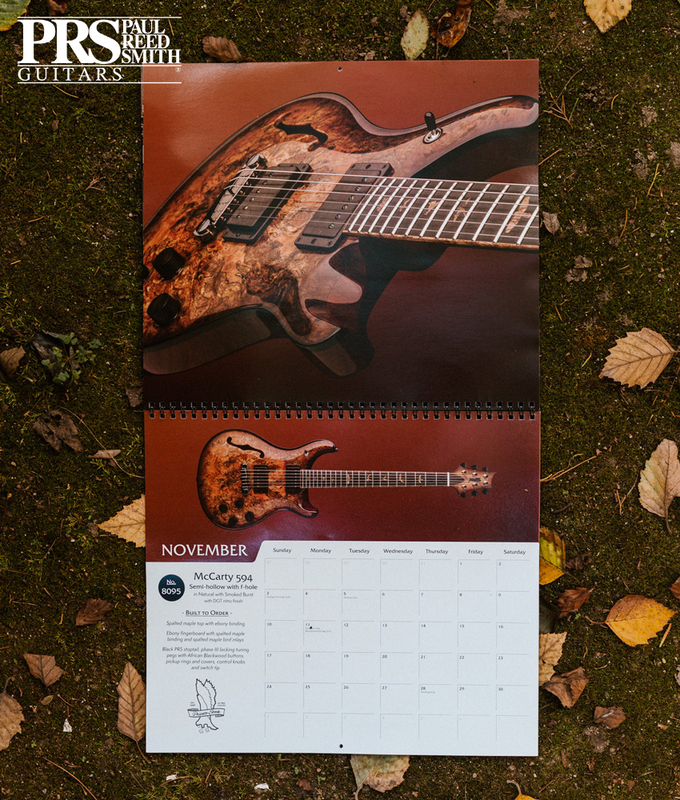 Each fall for the past 16 years, the Private Stock Calendar has been unveiled to PRS fans worldwide. This year we have 13 new and unique Private Stock guitars all photographed in stunning detail and on display in the calendar. 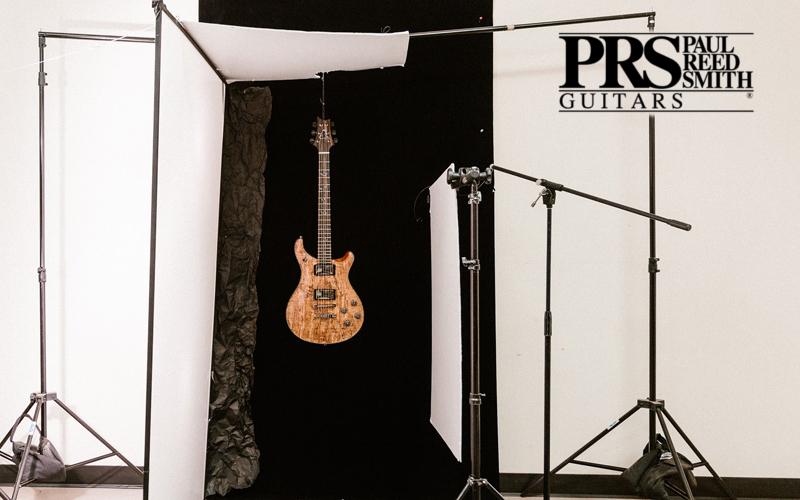 If you’re wondering how the PS Calendar project began, how the guitars are chosen, and what the overall process is like, we explore these questions in great detail below. PRS: So, how did it all begin? MQ: The idea of doing a calendar featuring PRS guitars had been batted around for a while in the early 2000’s. The more I thought about it, the more Private Stock seemed like the right subject matter. 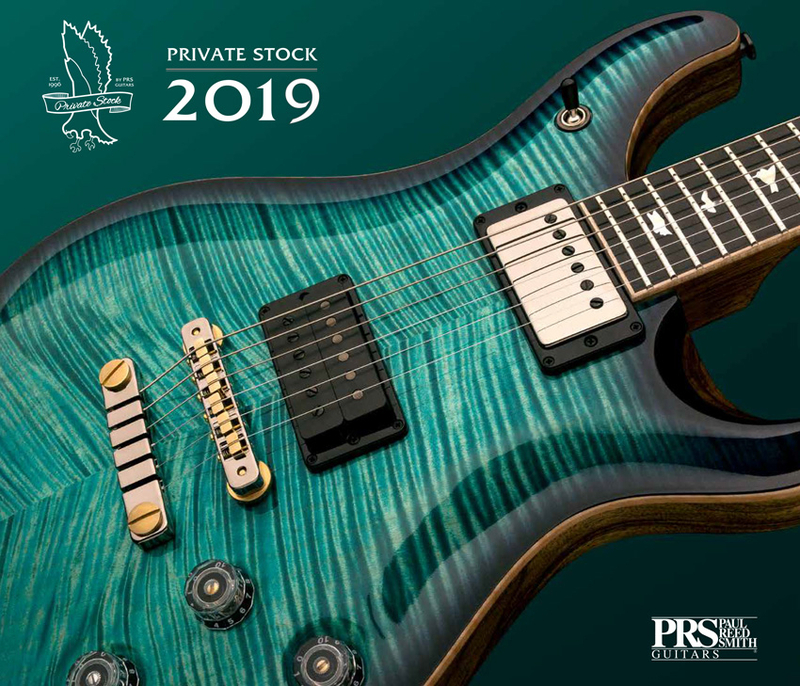 PRS: What makes Private Stock such a great subject for the calendar? MQ: When I started thinking about the project, calendars featuring Ferrari and other high-quality car brands came to mind. They’re aspirational, people tend to look at these calendars and sort of daydream about the beautiful cars. Likewise, I think all of our guitars are incredibly beautiful. From years of working on them and playing them I knew that they were aesthetically pleasing from any angle. The advertising folks at BMW would do this thing where they’d show a headlamp or a stick shift in close detail and it was abstract and beautiful. You had the sense that they really cared about the details and therefore the whole car. And I find that true with PRS, the level of detail is incredible no matter what angle you look at it and I wanted to show it off. 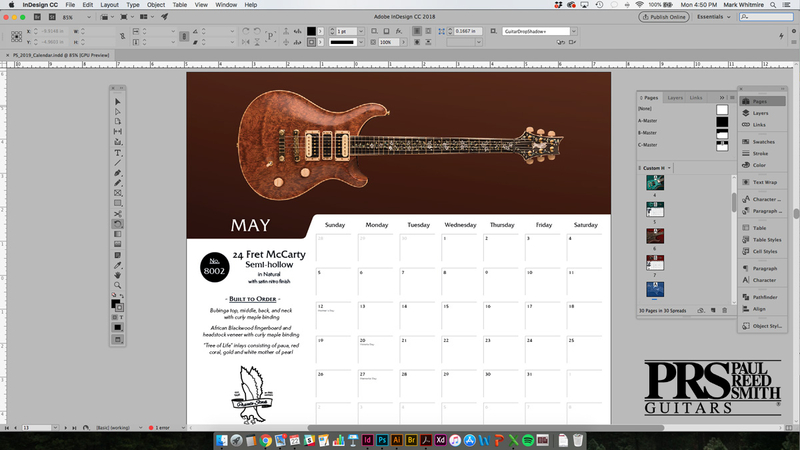 By nature, Private Stock guitars are more rare, they are custom instruments, so it seemed more fitting for the calendar. PRS: What goes in to choosing the guitars for the calendar? How do you decide what makes the cut? MQ: I photograph many of the Private Stock guitars we build either because it’s something we’ve never done before or that particular guitar caught my eye. I do this for two reasons: to have a reference for our company and to possibly use it for our calendar. When it’s time to outline the calendar I look through that folder and begin selecting the best. I like to show that we have diversity in Private Stock: basses, acoustics, differing body shapes, a variety of colors. I always gather more images than I need for the calendar and print a contact sheet for review – about 18 guitars. I’ll pass this list of 18 to our graphic designer Mark Whitmire to look through, and I’ll also share it with our Director of Marketing and members from the Private Stock team. Together we’ll narrow the 18 guitars down to 13, then I’ll set out to pick the particular image of each guitar that will be used in the calendar design. PRS: Is there something extra special about this year’s cover shot? How is the cover selected? MQ: Well to me, this year’s cover guitar is just stunning. I am not usually a fan of blue guitars, they aren’t something I would typically choose to buy or play. However, when I saw this guitar, I thought to myself, “I want that!” – it takes your breath away when you see it. It has a great chevron top and it’s a McCarty 594 layout which is one of my favorite models. It sounds great. 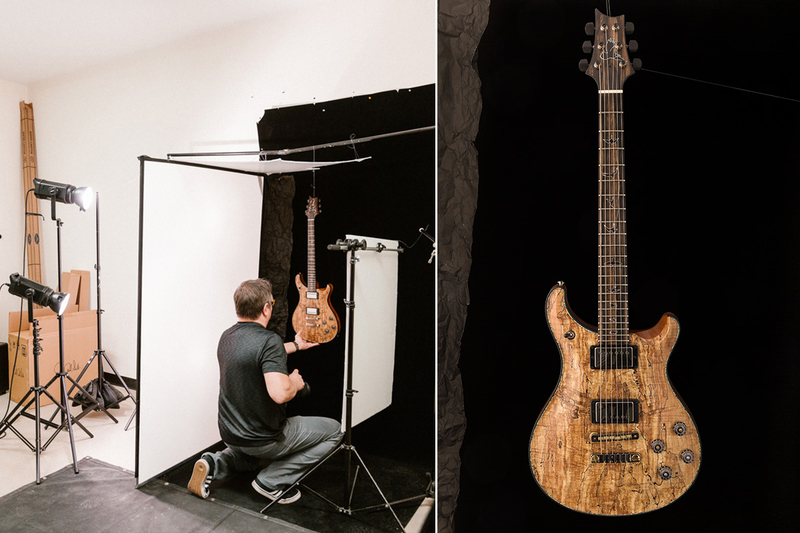 PRS: What is the process like to photograph the guitars and actually design the calendar? MQ: Everything begins with a tip from Eric or Tina, two of our Private Stock team employees. They’ll let me know if there is something special moving through the shop. I’ll go down and have a look, then I’ll borrow the guitar for an hour or so to photograph it. We have our own humble studio on premises that I use to photograph the Private Stock guitars. Sometimes other employees at PRS will alert me to a calendar-worthy guitar. It’s cool because the employees are so proud of what we’re doing and what they are working on that they want to share it with others. In the early 2000’s, for the first 3 or 4 calendars, I just did the layout. In later calendars I began photographing the instruments in addition to designing the layout. Today, I just do photography and our talented designer Mark Whitmire does the layout. In my opinion the calendars today look better than ever because of his input. PRS: When did you begin listing the specs of the instrument on the calendar, was that always there? MQ: It was a long time ago, but I think we were including specs on the earliest calendars. People ask us all the time about a guitar’s color or wood type so I think sharing the guitar’s details is part of the magic. The 2019 Private Stock Calendar makes a great gift for you or that guitar-crazed friend in your life, order yours today.